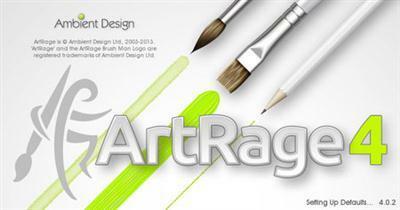 Ambient Design ArtRage Lite 4.5.10 Multilingual Portable | Free eBooks Download - EBOOKEE! Posted on 2017-06-18, by manhneovn. ArtRage 4 is an easy to use natural painting package that lets you create realistic artwork on your computer. It has a wide range of artistic tools that let you get right down to the creative process without forcing you to learn complex or technical controls. It's like real paint without the mess! Natural Painting Tools, Powerful Utilities, for everyone from the Pro to the Beginner. Whether you want to switch from real world painting to digital artwork while keeping that natural feel and artist freedom, perhaps do your own calligraphic inking, find a less frustrating way of learning watercolours, or have some carpet-friendly glitter for your kids, then ArtRage is for you! - ArtRage 4 offers professional level features, and is incredibly easy to use, allowing everyone from children to professional artists to make the transition from traditional to digital art. - ArtRage allows you to mix up your own paints, smearing realistically and mimicking real world art canvas textures and paint thickness. - It has been refined by ongoing feedback from real artists to create the most realistic chalk, oil paints, watercolours, inking pens and more. - It also offers highly customisable brushes, an intuitive interface that stays out of your way, and more fun and creativity than any other digital art program. No comments for "Ambient Design ArtRage Lite 4.5.10 Multilingual Portable".